A bride from Texas uses her CIA-honed skills to catch the real killer when her husband lands in a Canadian jail. I have to blame author Kay Kendall, author of ” DESOLATION ROW’ for the sleepless night I had, so that I could finish reading her novel. I just couldn’t stop reading until I discovered “Who Did It?” so to speak. 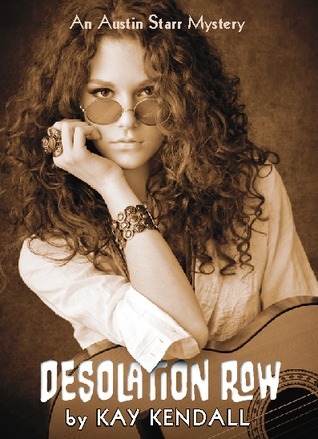 The genres for “DESOLATION ROW’ are Mystery, Fiction, and in my opinion, Historical Fiction. This novel brought me back to the end of the sixties, and reminded me of so many things. The year is 1968, and you are living in a foreign country that is supposed to be friendly to Americans. Although the times are turbulent and there is a lot of tension. Many American citizens have come to Canada as Draft Resistors for different reasons. Even within the resistors are factions that are split on how to handle the protests. The war in Vietnam is not like any war in history. Then you have a different political agenda, that of older men that fought during World War Two, and were proud to fight for America. Now, can you imagine that your nerdy, kind, gentle husband is arrested on suspicion of murder? You really can’t afford an attorney. You don’t have much of a support system. Your parents are in Texas, and not pleased at all that you left with your husband to go to Canada. Well, meet Austin Starr, a 22 young married student who came to Canada with her husband, who was her college boyfriend. Austin seems to have a major problem. The author describes the characters as complex and complicated. Some characters are angry, unbalanced, jealous, have strong convictions, and some characters have secrets important to protect. There are a number of characters who could be suspect in murdering a Draft Resistor that was not really well liked. What is the motivation and why? Austin turns to her Russian Professor and his daughter for help in finding who the “real killer is. Visiting her husband in the desolate jail spurs her on to look for clues.There are twists and turns and threats and danger. Then there is another murder. I appreciate the way Kay Kendall describes the history, the characters, and the intriguing plot. Having lived during this era, I felt like I was revisiting the past. There is the discussion of corrupt politicians, and the upcoming election, when Richard Nixon was running for president. The author also discusses how any war changes the lives of the people who come home and their families. To quote Kay Kendall,” While the past was set in stone the future was framed by hope and possibility.” The author describes the importance of family, peace love, hope and faith. I really tried to follow the clues, but I was surprised to find who the murderer is. I highly recommend this intriguing and thought-provoking novel for readers who have a passion for life in the sixties and for anyone who loves a mystery with suspense and intrigue. I received a copy for my honest opinion.